Earn 100 Cute Points upon purchasing this product. Soft hands, happy makers. Pack of 3 beeswax balm hand salve. 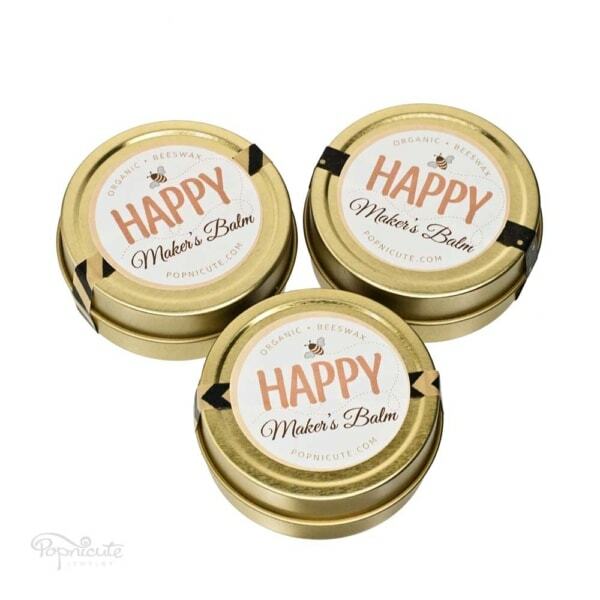 Happy Maker’s Balm in Tin Can. 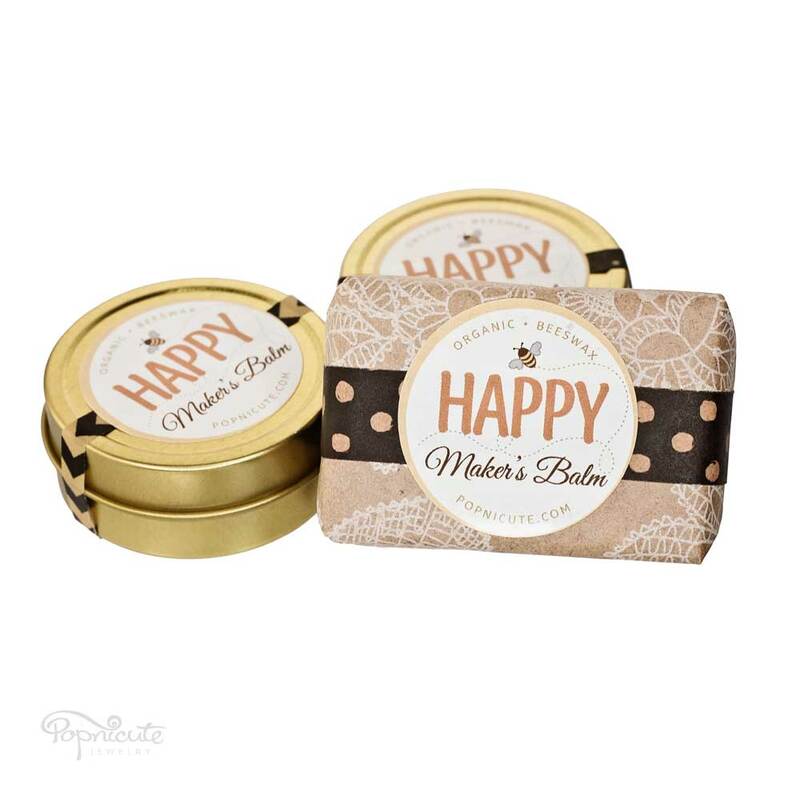 Happy Maker’s Balm in Paper Wrap. Know anyone with dry hands? Happy Maker’s Balm, like its name, would make a thoughtful gift for any creative person who works with their hands. Whether they are knitters, crocheters, jewelry makers, sculptors, mechanics, painters, seamstress, cooks, you name it. Anyone who works with yarn and fabric would appreciate it. You know dry and cracked hands are the number one offender when you’re working with yarn. Jewelry makers like me would love this beeswax hand salve as metal dirt and dust gets cleaned off easier on the beeswax protected skin. Take a small amount of it with your fingernail and place it on the back of your hand. Massage the beeswax salve into the back of your hands, palm, and fingers (also face and anywhere that’s dry). If your hands feel greasy that means you had too much of it. Wipe the excess off onto your arms and neck area. Continue your activity as usual and feel the benefits from the protective invisible seal that is the beeswax balm. Apply this beeswax hand salve before bed on face and hands to keep your skin soft and rejuvenating while you’re sleeping. Apply the protective balm to any dry patches of skin on your body. 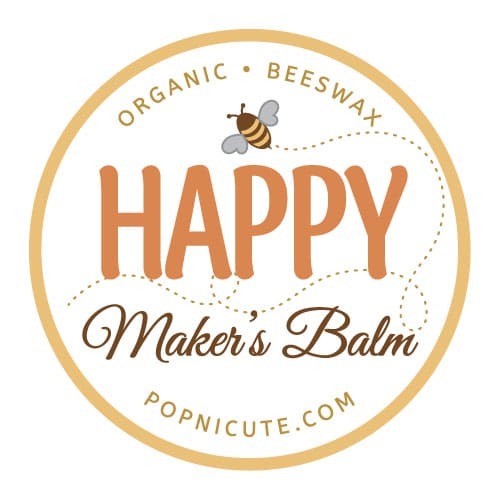 Happy Maker’s Balm is a hand salve that is 100% natural with NO preservatives. Made from local beeswax, coconut oil, olive oil, & vitamin e oil. It is good for lips, face, hands, elbows, feet, anywhere that needs deep moisturizing. Enjoy the sweet scent of honey from the beeswax. Paper wrapped: approximately 2 ounces/bar. Tin can: approximately 1.2 ounces/can. The paper wrapped beeswax balm is great for bathroom/bedroom use. Just place it on a soap dish and rub on your body like butter. For mobility and practicality, choose the tin can. New to Popnicute Jewelry, a beeswax balm hand salve to soften cracked dry hands, lips, elbows, and feet that’s extra moisturizing. Beeswax balm has antibacterial and healing properties that can soften cracked skin in a matter of days. As a maker, I constantly work with my hands and wash it many times a day. Without any moisturizer, my hands can easily get very dry leading to easily cracked skin especially during the harsh winter in Illinois. With this Happy Maker’s Balm, I noticed that my hands can go through a few washes without reapplying. The impermeable nature of beeswax helps the skin retain existing moisture from evaporating into the atmosphere, further preventing dehydration. When you wash your hands the first and second time with a regular hand soap, you will notice that there’s a thin layer of it that’s still lingering. Reapply after 2-3 washes. If you’re washing the dishes by hand, you may need to reapply right afterward as dish soap is a lot harsher and will strip any oil from your body. Enjoy the sweet scent of honey from the beeswax. The scent is not at all overpowering. In fact, it’s so soft you won’t smell it for long after it’s applied to the skin. The beeswax comes from a bee farm in Quincy, IL. All natural product that’s locally made. As someone who is sensitive to smell, I’m happy to report that I haven’t had a headache caused by the smell of beeswax. INGREDIENTS: local beeswax, coconut oil, olive oil, & vitamin e oil. Benefits of Beeswax Balm Salve. This beeswax balm salve will also protect the skin, giving it a clearer look characterized by the sheen of a robust appearance. Many worry that applicating it directly to the skin will cause acne, but beeswax is proven to be noncomedogenic, so it will not clog pores. I feel like after I regularly used this balm on my face, my acne is smaller, not so bumpy, and rarer now. Dare I say that my complexion also looks more radiant and clear. Benefits of Vitamin E oil. PS: there was a mistake on my part. This beeswax balm salve does NOT contain any essential oil. I will change the sticker on the next batch.